For a cheap hotel at Gatwick bundled with long term car parking the Gatwick Europa Hotel is normally be one of the cheapest options to consider. 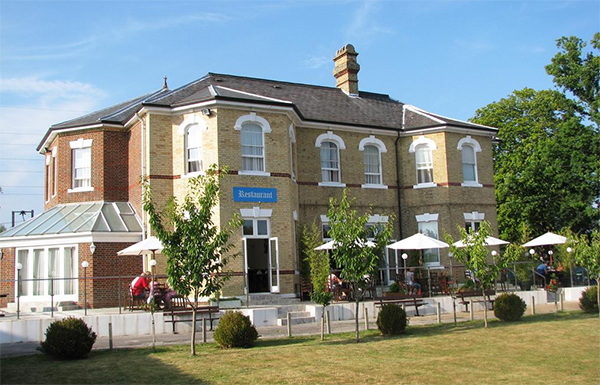 In the grounds of the Europa is the Gatwick Europa Lodge annex which can be even cheaper than the main building and often also has very cheap hotel with parking deals available. Car parking is at the hotel itself. with taxi transfers to and from Gatwick Airport - details below. Outward appearance is framed by Spanish and Mediterranean architecture and the hotel is sited in large wooded grounds. The Gatwick Europa is situated south of the airport in the outer suburbs of Crawley, the nearest major town to Gatwick. The Europa Hotel Gatwick is conveniently situated adjacent to junction 10A of the M23 motorway with fast direct motorway access to Gatwick Airport a couple of junctions down the motorway. Spindles Health and Leisure Club features an indoor heated swimming pool with an impressive timber roof. There is also a sauna, steam room and fully-equipped fitness centre with exercise classes and professional instructors. Rooms available: Single, Double/Twin. Family rooms for 2 adults, 2 children. Paeking is at the hotel. Airport transfers are by taxi accommodating up to 4 people, run on demand, taking 15 minutes. The service was last advised as costing £10 per vehicle each way using the taxi company recommended by the hotel. Rooms: All bedrooms offer a TV, ttelephone, hairdryer, tea and coffee facilities and a private bathroom. Internet: Free wi-fi available in public areas. Two twenty minute free sessions of wi-fi in rooms; £7 charge per 24 hours for further use. Room service: Only continental breakfast is available through room service. Spindles Health and Leisure Club features an indoor heated swimming pool with an impressive timber roof. There is also a sauna, steam room and fully-equipped fitness centre with professional instructors. Access to the leisure facilities carry a charge. A restaurant offers a fresh carvery menu daily open in the evening only and for a buffer breakfast in the morning. Rafters bar is located in the lounge.